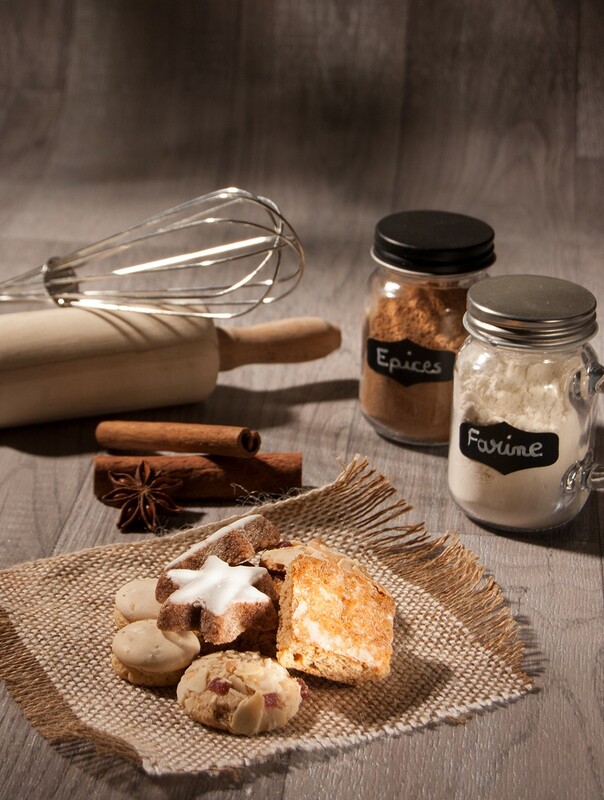 Aniseed sablé biscuits, small florentines, cinnamon stars or leckerlis*: everyone has their favourite bredele! light squares of gingerbread with almond slivers and orange peel, glazed with cinnamon. Cinnamon stars - Soft gingerbread with almonds, hazelnuts and cinnamon : sugar, almonds 18%, hazelnuts 16%, egg white, humectant: sorbitols; inverted sugar syrup, wheat flour, fructose, orange peel, cinnamon 1.5%, glucose-fructose syrup, vegetable oils (palm, sunflower, rapeseed), wheat starch, powdered skimmed milk, rice flour, salt, emulsifier: soy lecithin. Aniseed biscuits - Small biscuits with green anise seeds : sugar, wheat flour, eggs, green anise seeds 1.8%. Leckerlis: Pieces of orange-flavoured gingerbread with almond slivers : wheat flour (gluten), sugar, inverted sugar syrup, 10.1% almonds, 10.1% orange and clementine preparation (clementines, orange peel, glucose-fructose syrup, acidity regulator: E330, preservatives: E202, E220 (sulphites)), sugar, humectant: sorbitols, honey, 2.5% candied orange peel (orange peel, glucose-fructose syrup, sucrose, preservatives: E202, E220 (sulphites), acidity regulator: E330), raising agents: sodium carbonates, ammonium carbonates; spices. 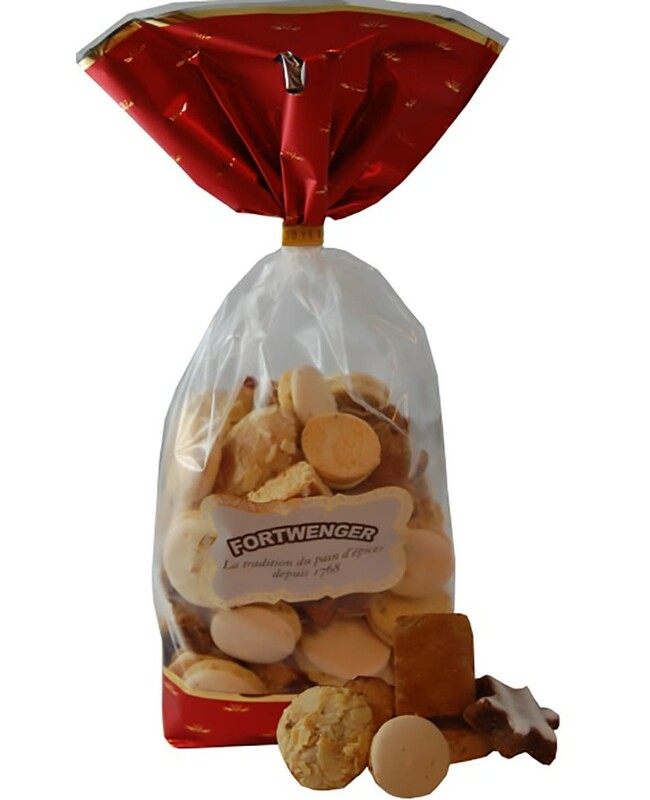 Small florentines: Small almond-flavoured biscuits with candied fruit : sugar, almonds 17.4%, wheat flour (gluten), orange and clementine preparation 12.1% (clementines, orange peel, glucose-fructose syrup, acidity regulator: E330, preservatives: E202, E220 (sulphites)), egg white, candied papaya 8.9% (papaya, sucrose, acidity regulator: E330, preservative: E202; colourings: E120, E150a, E133), hazelnuts, firming agent: glycerin; raising agent preparation (raising agents: sodium diphosphates and carbonates; cornstarch), vanilla flavouring. Gluten, milk, soya, eggs, almonds, hazelnuts, sulphites. May contain traces of milk, eggs, soya, lupine, nuts, peanuts and sesame seeds.